Well of course #FoodTVChat with Claudia Sandoval was a blast! As you probably know Claudia is one of the 5 remaining finalists on Master Chef 6 and you just don’t make it that far without being awesome, right? At this point in the competition it’s as much about passion and grace under pressure as it is about cooking and Claudia is as passionate and gracious as they come. What makes the food that Claudia cooks so special? What does the belief that the best food is made from love mean to Claudia? Where was Claudia’s “happy place” on the Master Chef set? What did Claudia learn from Gordon Ramsey? And what’s next for Claudia Sandoval? 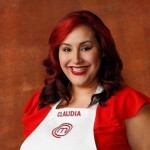 We wish Claudia nothing but the best in her future endeavors and most immediately, we wish her the best tonight on Master Chef! Join us this Thursday, September 3rd for #FoodTVChat when our guest chef will be Food Network Star finalist Jay Ducote. We can’t wait!